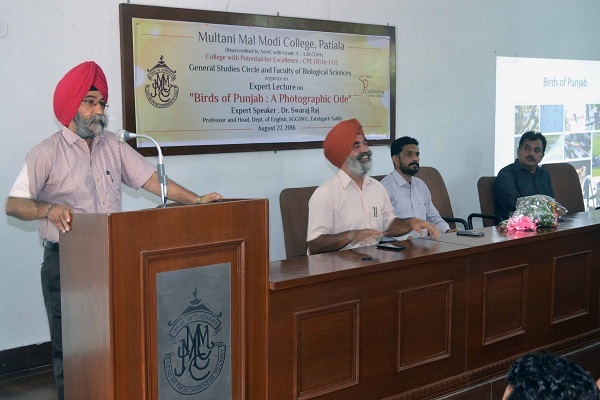 General Studies Circle and Faculty of Biological Sciences of M M Modi College, Patiala organized a unique talk titled “Birds of Punjab: A Photographic Ode” to make the students familiar with the birds and their habitats. Dr Swaraj Raj, Prof and Head, Deptt of English, SGGSWU, Fatehgarh Sahib was the resource person who showed more than 150 photographs clicked painstakingly by him over the years and explained peculiar characteristics of the birds. He said that those who like birding will never damage the environment. 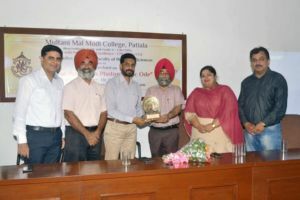 Principal Dr Khushvinder Kumar appreciated the efforts of the organisers in making the students aware of the umbilical cord between the environment and birds. He said that because of our insensitivity towards this relationship, some beautiful birds have become extinct and if timely corrective action is not taken, more will be lost before long. Prof Nirmal Singh, Dean Commerce and Convener of General Studies Circle, emphasized the need to save old trees and water bodies to attract variety of migratory and local birds. He said that each tree is an independent eco-system. During the interactive session, extremely probing questions were raised by the participants and Dr Swaraj Raj answered them in equally articulated manner. Dr Ashwani Kumar, Dean Biological Sciences thanked the staff and students for their enthusiasm. A memento was presented to the resource person. Prof Ganesh Sethi and Ms Bhanvi were also present on the occasion.